I’ll admit it, last week’s news about the new Mac Pro got me excited about the future of the Mac for the first time in a long time. Note that I am not in any of the target markets for a typical Mac Pro buyer—I don’t crunch huge scientific data sets, I don’t render massive 4K movies, and I’m not compiling huge programs on a daily basis. But I have always been a fan of the Mac Pro for one reason (up until the most recent one, at least): Customization. Having a customizable Mac means it can last longer, as you can make changes to keep up with technology. I have owned both the Motorola and Intel era Mac Pros, and they were truly excellent machines. The older Mac Pro (and its predecessors) were—as I recently wrote—wonderful machines, because you, the user, could do so much to them. You could add RAM, of course, but you can do that to most any current Mac. Beyond RAM and hard drives, though, you could also upgrade the video card and even replace the CPUs. If you replace the hard drives, the video card, and the CPUs, you’ve essentially got a new Mac (subject to the constraints of RAM speed and other hardware limitations) without having to replace the machine. And unlike the iMac, even if you do want to replace the entire box, you don’t have to also get rid of a perfectly good display, too. Buy a used 2012 Mac Pro ($1.5K-$2K). Which of these options turns out to be best depends on your intended usage. Need lots of cores for video processing? The 2013 Mac Pro is probably a good bet. Need CPU speed more than cores? Buy a loaded super-fast iMac. Value expandability beyond raw CPU speed or processor cores? 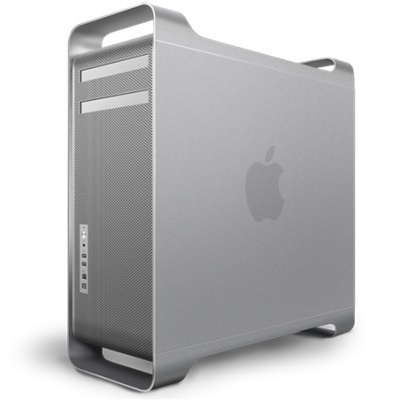 Buy the used 2012 Mac Pro (and install some of those upgrades discussed above). Honestly, if you want the best of all worlds1The tradeoffs are difficulty of setup (you build it! ), and Continuity, Handoff etc. can be tricky, plus you’re not using Apple hardware, and it could be broken by a software update. today, the hackintosh route is worth serious consideration. Over the years, these homebuilt Macs have gotten more and more Mac-like thanks to the ingenuity of those who create the unofficial installers. You can now, for instance, generally install macOS software updates without fear that your Mac will require a fix of some sort after the update. You can get lots of cores. And/or lots of CPU speed. And room for as many drives inside as you may want. You can tuck it all in massive case with tons of room to grow. Or a smaller more space-efficient case. A case with neon—the only limits are your creativity and your budget. 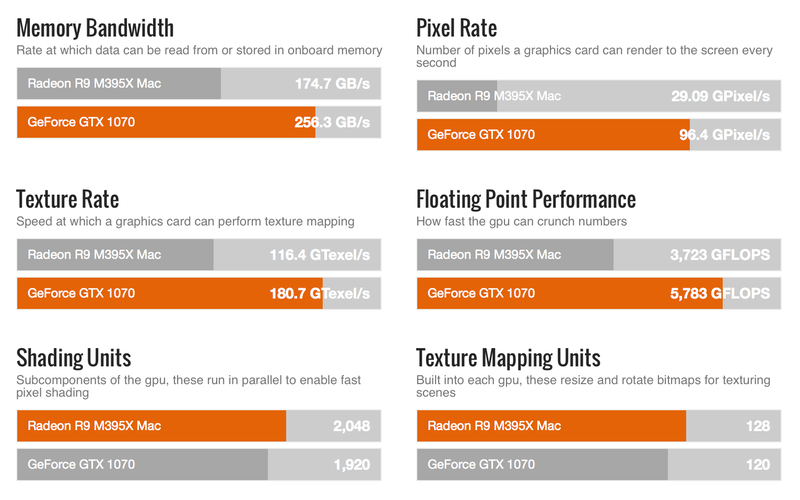 And perhaps best of all—especially if you enjoy gaming on your Mac, too—you can get excellent graphics performance with a high-end video card. This is even more true with NVidia’s very recent announcement of Pascal driver support on Macs. This means you’ll be able to use any of the wicked-fast NVidia 10 series graphcis cards in your hackintosh. See the full results on the gpuboss web site. Change the comparison card to the GTX 1080 Ti or the Titan, too. I’d include a comparison to the AMD Fire cards in the Mac Pro, but I can’t find a site that has that very old card (its technology dates to 2011) for comparison. Which route would I take, if I were in the market for a Mac Pro today? Honestly, I’d probably build a hackintosh. It’ll cost less than any of the other options (except possibly the used five-year-old Mac Pro), and yet will be more powerful and more expandable. The risks, of course, are that it’s not Apple hardware, and Apple could (in theory) break it intentionally with a future software update. But knowing there’s a new Mac Pro coming soon, this seems like the best way to get the most performance with the least investment. And you know what, I am sort of in the market for a faster Mac, so I’m going to be investigating hackintosh builds over the next few weeks. Fast forward to (hopefully) early 2018, and Apple releases a new Mac Pro. And possibly sometime before then, a new iMac Pro. These are the machines that have my hopes up for the future of the Mac with the “Pro” segment. An iMac with a real graphics card and desktop-class hardware (instead of the mobile card and laptop hardware) would be an intriguing machine. And as far as the “new new” Mac Pro, Apple has a history of building excellent and expandable Pro Macs, so hopefully they can do it again. Between those two machines—and a new standalone display—I’m hopeful that Pro users will have reasons to give Apple their money again in the near future—unlike for most of the last four years. I certainly hope they create something worthy of giving them some of mine. I’ve got a Mac Pro, but I’ve also just built a new i7 based PC – whilst it can be a hacintosh, it’s nothing that I’d want to rely on as a mission critical tool in it’s alternative guise. Apple don’t (yet) support the latest 7th Gen Intel Core processors, so I have to tell macOS that my Kaby Lake i7 7700K is really an older 6th Gen Skylake CPU and, as you mentioned, the latest 10-series NVIDIA graphics cards aren’t (yet) supported, so that wicked 1080Ti isn’t going to be doing anything under macOS at least until NVIDIA release the new web drivers. With lots of PCs having a native UEFI firmware, making a hacintosh is now easier than it has been in the past when dealing with computers with a BIOS, however now that PCs have hardware that’s at least one generation newer than in any shipping Mac, this complicates things again. Once Apple ship new iMacs some time this year with Kaby Lake CPUs and NVIDIA update their web drivers with Pascal support, everything will be a lot simpler with less hacks required. I can’t wait to see what Apple do with the new Mac Pro – the current one will someday be an oddity of the past, like the 20th Anniversary Macintosh and the G4 Cube – anomalies that only existed for a single revision before being shelved in favour of something more practical. Whilst I can’t see Apple going back to the huge silver tower of the G5/Mac Pro – I think a larger form factor than the trash can will allow for greater flexibility, more upgradability and a longer lifespan. Have a look at what Corsair are doing with the Corsair One for what is possible in PC land – a silent, small form factor PC with top-of-the-line components and factory water-cooling.